Palestinian cartoonist Mohammad Sabaaneh and New York cartoonist Eli Valley will have a conversation about their work — its inspiration, its purpose, and its impact on diverse audiences. They’ll discuss their approaches to making comics about the Israeli-American-Palestinian situation, the role of comics in the current political climate, and their future plans. Mohammad is the Middle East representative of the Cartoonists Rights Network International. 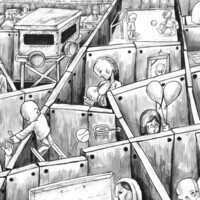 He has had solo and group exhibitions of his work in numerous countries around the world and has conducted cartooning workshops in many parts of Palestine. Last fall, he won the Medaille d’Or at the Marseille Cartooning Festival. Shortly after that, he was hailed by the UN’s Committee on Palestinian Rights as one of Palestine’s two best-ever cartoonists — along with the late Naji al-Ali, and was featured in the exhibition and gala they staged at UN headquarters in New York. This year, he has already made appearances in Edinburgh and London. In late September, his “History of Palestine” frieze was lauded as breakthrough art in the US Campaign for Palestinian Rights’s first-ever artists’ competition. To keep up with Mohammad’s work, you can follow “@Sabaaneh” on Twitter or Instagram. Eli Valley is a writer and artist whose work has been featured in The Nation, The New Republic, The Village Voice, The Nib, The Daily Beast, Gawker, The Best American Comics, and elsewhere. The 2011 – 2013 Artist in Residence at The Forward newspaper, his art has been labeled “ferociously repugnant” by Commentary and “hilarious” by The Comics Journal. His book, DIASPORA BOY: COMICS ON CRISIS IN AMERICA AND ISRAEL (OR Books, 2017), was heralded as “one of the most fascinating and darkly humorous books in living memory” by The Los Angeles Review of Books, and his art is featured in The Chapo Guide to Revolution: A Manifesto Against Logic, Facts, and Reason (Touchtone, 2018). His website is www.elivalley.com.